God has remained faithful to Grace Baptist Church through the years, enabling us to build upon a Christ-centered foundation and to find practical expression for our Christian testimony. In 1968 Grace Baptist Christian School opened and has been used of God to educate many young people. Meeting in the Grace Baptist Church facility, the school is governed by a Board comprised mostly of members of the church and provides a God-centered education in a traditional classroom context. 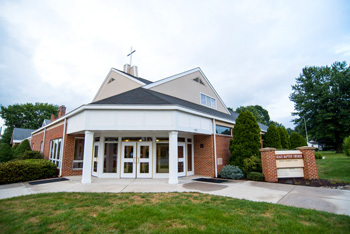 The school (grades K-8) is taught by a faculty of eight full-time and four part-time Christian teachers and has an enrollment of over 125 students from the greater Carlisle area. For over three decades annual family conferences sponsored by the church each summer have benefited Baptists with Reformed convictions. Most recently we have contributed to the birth of the Association of Reformed Baptist Churches of America, reflecting our commitment to send the gospel of Jesus Christ throughout the earth. For the past half century of our existence as a church, the Lord has blessed us with faithful ministers. Our beloved pastor Walt Chantry, who began his labors amongst us during his years as a student at Dickinson college, upon graduating from Westminster Seminary was ordained and in 1963 began his long and fruitful pastoral ministry at Grace Baptist Church. In June of 2002 he retired only to find that his gifts and talents would be needed for the church at large. In October of 2002 Walt accepted the position as editor of the British based magazine The Banner of Truth and continued in this ministry for seven years. Walt and Joie now reside in Waukesha, Wisconsin. A history of Grace Baptist Church entitled Reflections on Grace is available from the church Book Room for $10.00. This includes postage and handling. Checks should be made out to Grace Baptist Church Outreach Account.